In Part III, we’ll go through what we can do at the grassroots scale, as individuals and communities, to build the local resilience which will help us weather the coming storm. This post is an excerpt from a longer paper, "Economic Resilience," which is being posted online in serial form. Links to the full document can be found here. Daly and his Steady State Economy poses a nice idea: we understand that the presumption of perpetual growth won't work, so instead of growth, let's keep it steady. We don't have to grow; we'll just create a nice steady plateau, right where we are now. But right now we’re at five-planets-worth-of-consumption. Hmmm, Daly conveniently overlooks that part. We cannot expect to maintain a steady state economy at present levels because present levels are deep into planetary overshoot. That means we must phase back quite a bit before we establish that steady plateau. Just like Holmgren's Energy Descent curve contains within it the concept of powerdown, we'll have to phase back from five-planets-worth-of-consumption to something more aligned with one-planet-worth-of-consumption before we stabilize into that steady state. Thus Daly’s diagram, instead of looking like the tidy arc in the inset image, should instead be bell-shaped like the “Creative Descent” track on the Holmgren diagram, toward greater well-being at lower GNP. Daly’s blue “Lifestyle” oval is drawn in entirely the wrong place. Although in 2008 Daly recognized that the end of the growth economy was coming, his writings are still very much concerned with the globalized economy – how to tweak it with taxes, or new definitions of “income” and GNP. But you cannot tweak a doomed, crumbling structure. Daly’s flat plateau concept was useful in opening people’s minds to begin to think out-of-the-box, to consider what a post-growth economy might possibly be like. But with our Transition movement awareness of the limitations that peak oil will impose, we understand that relocalization is inevitable. And as far as local solutions, what I have seen of Daly’s writing gives us very little to work with. The Ellen MacArthur Foundation's circular model has some great graphics and good concepts, that just like in nature everything should be regenerated: renewable energy, waste for one industry should become raw materials for another, etc. But there is no mention of the staggering economic adjustment that limited oil in the system is going to bring; there is no mention of the significant energy descent journey. Just like Daly, the Ellen MacArthur ideas avoid mentioning five-planets-worth-of-consumption. In order to get to the level at which we can maintain that nice circular model, there must first be a powerdown. There must first be a very substantial cutback in consumption and volume levels. Stoneleigh’s estimate on the devaluation of Hopkins' house may have raised his skepticism, but her forecasts seem pretty good for some neighborhoods (“Housing bust creates new kind of declining city” and fresh declines, L.A.Times). In my opinion, she's right on target with her understanding of the big picture, and the show isn't over yet. In Stoneleigh’s Transition Conference talk, she brings out the issue of the credit markets. In my talks I call those the dandelion fluff. An economy should be built upon fairly solid transactions: I build a chair, and you buy it. You bake a loaf of bread, I buy it. These are solid economic transactions. But it gets really weird and warped when one bank is buying another bank's mortgage paper at a discount, or you're buying a stock which is valued not by underlying assets but merely by its popularity in the market, or you're drawing cash out of a refinance on the real-estate-bubble-inflated value of your house. That's fluff. And at present, fluff transactions amount to 349% of the solid transactions! Our economy is very much out of touch with the real stuff of the planet. I haven't heard what Stoneleigh uses for source material, but her projections aren't too far off from Robert Prechter's calculations which come up with some of the same answers about the depth to which the markets will eventually decline. Referring to the emotions-of-a-market diagram again, you'll see what I mean that the show isn't over yet. Tim Jackson's Prosperity Without Growth is the most interesting of the resources that Hopkins listed. In critiquing these resources, I was looking for writers who acknowledged the full reality that developed countries will have to do some significant adjusting downward, both in expected volume of economic transactions and in material lifestyles, before we can stabilize to a level where the "without growth" part can realistically take place. While Jackson doesn’t completely dodge it, he puts it so politely and politically that it might easily be missed. If you can slog through the heavy economists’ lingo, you’ll eventually learn Jackson agrees that our society hasn’t yet tried very hard to achieve decoupling. He does understand that absolute decoupling is indeed essential -- decreasing our resource impacts overall. But despite Jackson’s (buried) admission that “Business as usual is grossly inadequate,” it seemed like Jackson still harbored a hope that somehow a redefined version of “growth” might still be possible. In other chapters, Jackson strongly endorses the idea of government stimulus. He goes to great lengths to explain what “green stimulus” might look like and how it could be designed. He endorses investing in jobs, assets and infrastructure – and doesn’t seem to notice that even if these are “green,” the best they could achieve would be relative decoupling rather than absolute. Jackson’s suggestions presume that a drawn-out, leisurely timeline is available, and they completely overlook the warning rumbling and crumbling that is becoming increasingly evident within our economic systems. These big-picture suggestions offer us little in the way of suggestions for what to do at the local level to develop resilience to major systemic shocks. Jackson's TED talk is fascinating in that he honors the inner journey -- both the journey which got our developed societies so very far off track, and the values we can celebrate as we create the new structures which we will have to create. He explains that humans have deep evolutionary tensions between what he terms “self-regarding behaviors” and “other-regarding behaviors,” and in this he is aligned with Jeremy Rifkin (“The Empathic Civilization” YouTube). Jackson explains that we have another set of tensions between our drive for novelty (new stuff, new ideas, new adventures, new experiences, our adaptive aspect) and tradition (the things essential for the stability to raise families and form cohesive social groups). 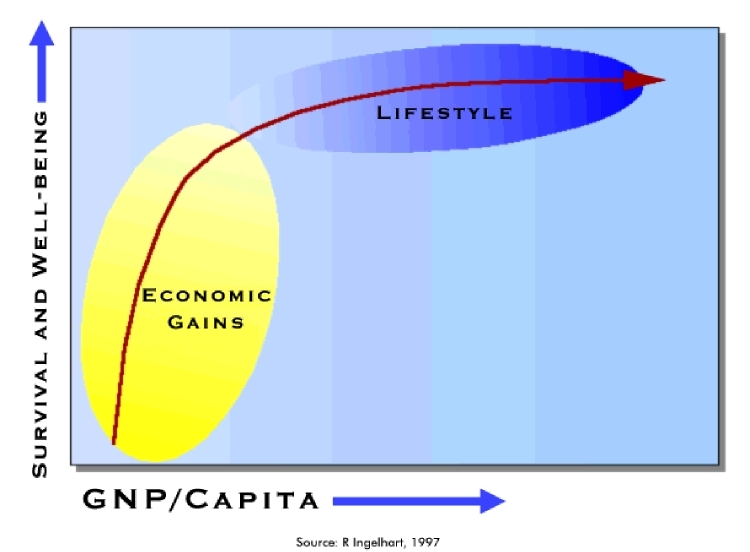 He points out that our current economy encourages only one narrow quadrant of the human soul. And he concludes that radical change in the economy isn’t about changing human nature but rather about recognizing the depth and breadth of the human psyche. In Jackson's Totnes talk, a much more informal forum, Jackson’s understanding of powerdown and economic contraction are at last revealed. The most powerful moment of all my Jackson reading or viewing came when he gently reminded Naresh that rather than merely creating the more-resilient economy of the future, the task we currently face is that we must build resilience through collapse.